You want the very best for your child, and so do we! ​We know how important it is that your child receives both loving care and an innovative learning environment while they are away from you. Talented Tots was founded in 1999 by mother-of-five Tina Kennedy, with the mission to provide high quality education and care in safe innovative learning spaces. Tina continues to lead us in delivering this mission. Since we first opened all those years ago we have established two more centres and become skilled at creating learning programmes and care routines that successfully support children to become happy, secure life long learners. We proudly employ teachers with whom we would entrust with the care of our own children and grandchildren, and we are hand-on-heart proud of the quality and commitment of our teaching and leadership teams. Our philosophy is based on the principles and goals of Te Whariki, the New Zealand Early Childhood Curriculum. Our staff and centres acknowledge and value the principles of The Treaty of Waitangi and ensure the success of all learners including Ministry of Education identified priority learners: Maori, Pacifica, Infants and Toddlers. We aspire for all children to grow up as competent and confident learners and communicators, healthy in mind, body, and spirit, secure in their sense of belonging and in the knowledge that they make a valued contribution to society. 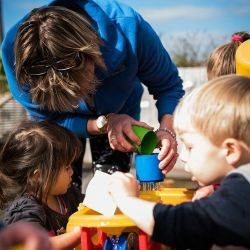 We believe children learn and develop in an environment where they are happy, secure and that they enjoy themselves through being exposed to a wide range of learning opportunities, alongside warm caring staff. This in turn will promote the holistic way that children learn. 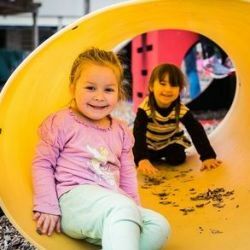 We believe that early childhood experiences promote the well being of the parents, family and child, and will increase the opportunity for success throughout the child's life. Each centre has an individualised teaching and learning philosophy statement displayed in the centre foyer. Please read this when you visit your preferred centre. We value and acknowledge that every child, and each family, is unique. We understand that every child requires an individual plan to best suit their transition into the centre. Our caring staff feel its importatant to take the time to get to know your child well before they start at Talented Tots. 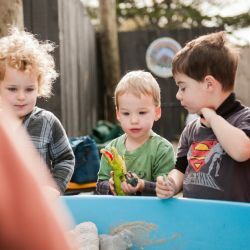 Once the transition plan has been completed and both you and your child's teachers believe the child is ready your child is able to start at Talented Tots - and the fun and play-based learning begins!